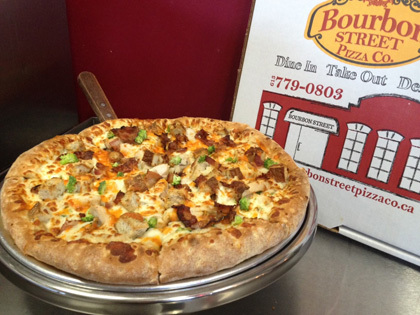 Bourbon Street Pizza is locally owned and operated in the heart of downtown Belleville. The Juby family opened this restaurant February 2013. Striving to create something different; a cozy atmosphere, family orientated, kind & friendly service and above all great food. We achieve superior quality food, by making our own dough in-house, and cutting our own meats, vegetables and cheese by hand. We specialize in pizza but still offer: pastas, salads, sandwiches, wings & ribs. Bourbon Street Pizza Co won Belleville's Readers Choice Favourite Pizza Place of 2013.